It’s Speedy Tuesday! Our weekly recurring topic on the Speedmaster has become one of the most popular topics here on Fratellowatches. This week, we have quite an uncommon Speedmaster for you. Only the shape and reference number reveals that it belongs to the Speedmaster-family. 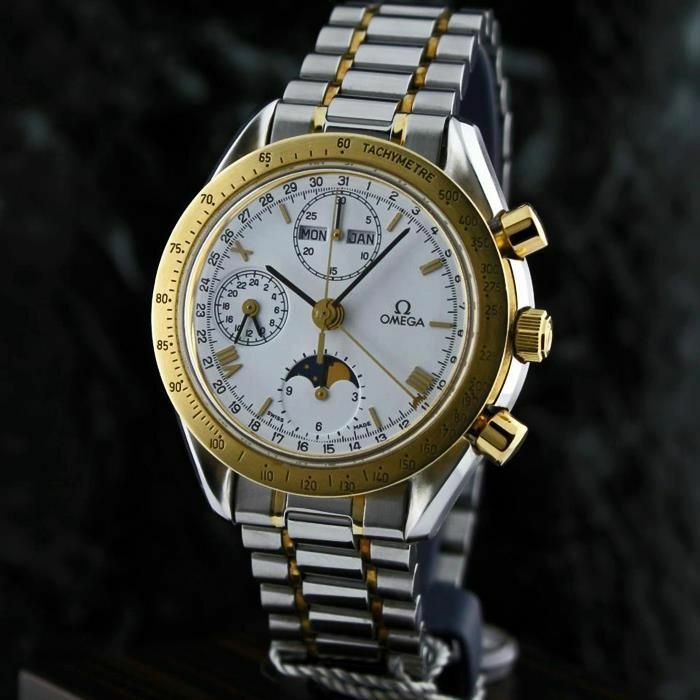 This OMEGA Speedmaster ref.3330.20 (case number 375.0034) is a stainless steel / gold chronograph with a calendar and moonphase (click here for some other Speedmaster Moonphase articles). 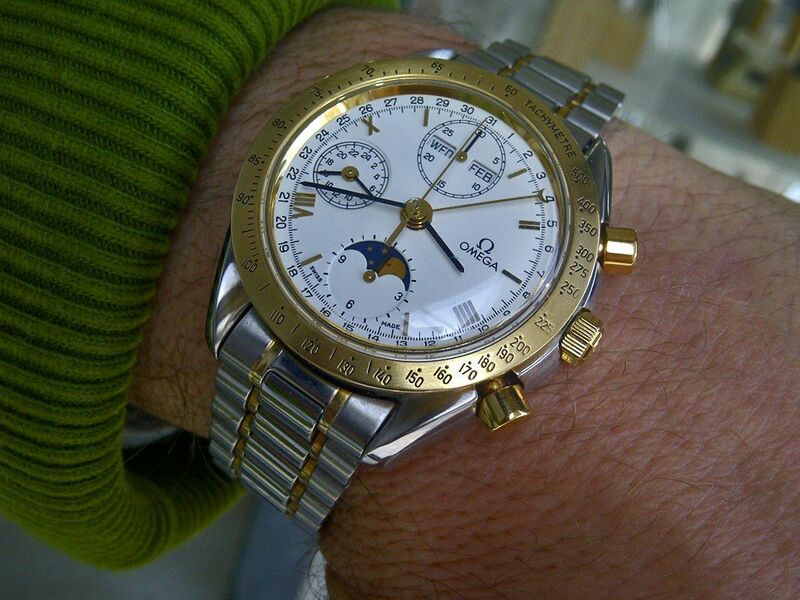 Introduced in 1990, this automatic OMEGA Speedmaster Moonphase 3330.20 comes with the OMEGA caliber 1150 movement. A movement based on the ETA/Valjoux 7750 caliber. Besides time and chronograph functionality, this watch had a triple calendar, a moonphase and a 24 hour indicator. This Speedmaster Moonphase has the same case as the Speedmaster Reduced collection, but with a small corrector at 10 o’clock for correcting the calendar. 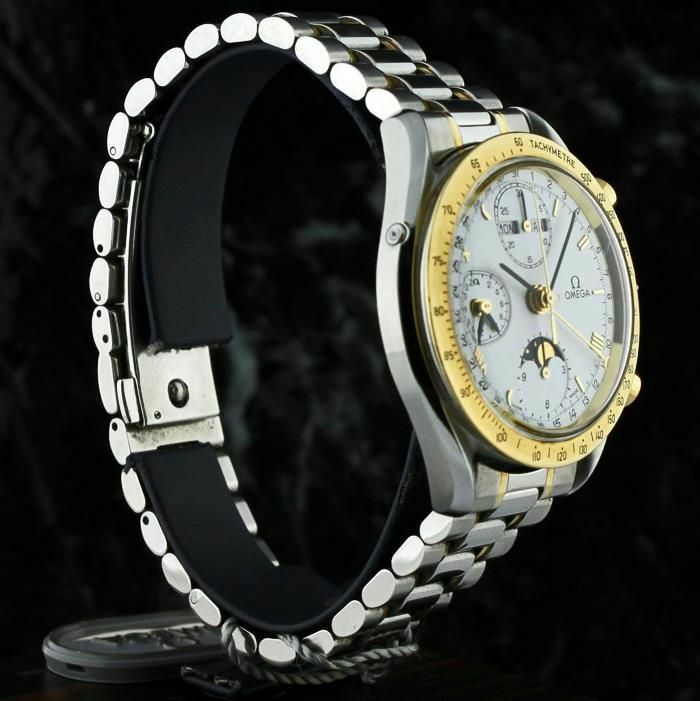 The bezel is 18 carat gold, whereas the crown and pushers are – unfortunately – gold-plated. Another un-Speedmaster-ish aspect of this watch is the case back. There is no Seamonster engraved or does it say ‘Speedmaster’. Instead, this Speedmaster 175.0034 case has an inscription (embossed) of the OMEGA logo, embossed OMEGA wording and the sentence: “Maison fondée en 1848”. A reference to the founding year of the OMEGA company. 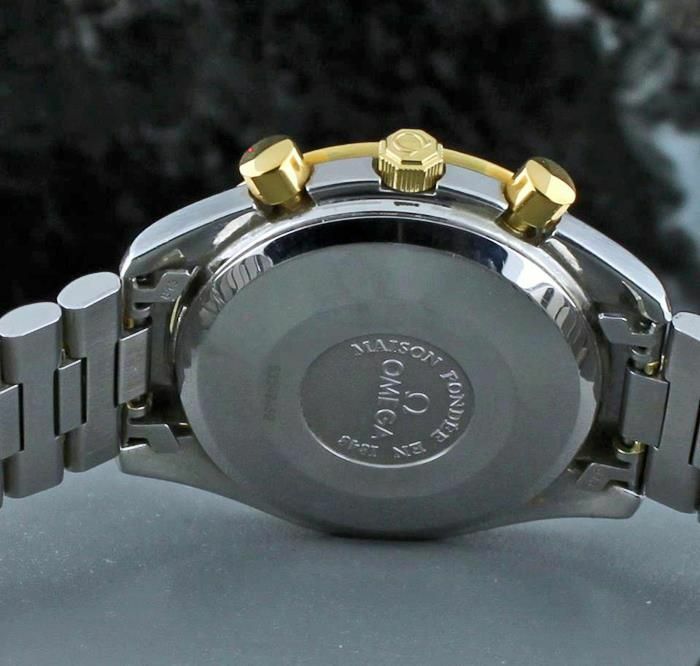 Below the logo, the serial number of the watch has been engraved. Something that OMEGA normally engraves in one of the lugs of a Speedmaster. However, we’ve seen engraved serial numbers like this in the caseback of OMEGA Constellations though. 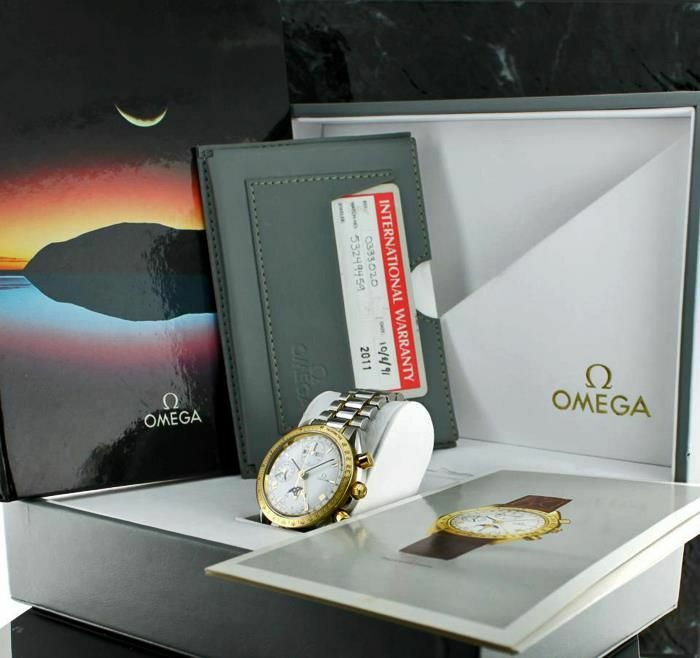 A typical 1990s package of OMEGA. Grey leather box, grey warranty card holder and grey plastic warranty credit card. Good thing about the old grey boxes is that they hold better than the later red leather boxes. Somehow, these red leather boxes from the late 1990s and 2000s all had the same problem, they degenerated in just a few years. The Speedmaster Moonphase 175.0034 case has a diameter of 38mm, just like the Speedmaster Reduced 3510.50. Although smaller than the OMEGA Speedmaster Professional series, it still wears comfortable and doesn’t look silly on large wrists. A classic watch like this, which is more of a dress watch than a sports chronograph, shouldn’t be too large in our opinion. Collector and professional watch seller Andreas S. Gregoriades sent us the above photographs. A big thank you! Article written by Robert-Jan Broer for www.fratellowatches.com. Every Tuesday we post an OMEGA Speedmaster-related article. Send us a photo and a short story about your Speedmaster and we will publish!